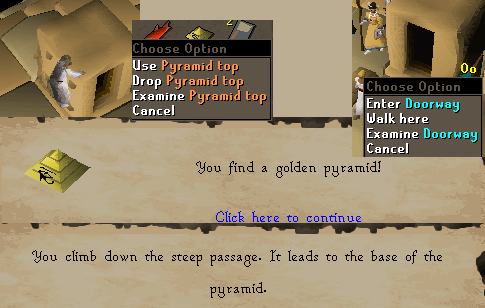 The Agility Pyramid is an Agility training course where you climb to the top of a Pyramid to retrieve a Pyramid Top artefact. 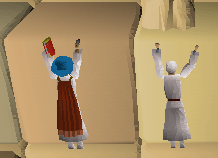 This guide will help you through the pyramid and provide some helpful info to all of you Agility adventurers! These items and equipment are a "must-have" while in here. This can be anything you want. 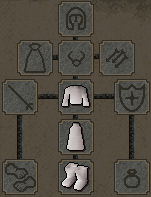 The suit doesn't matter at all, though I would wear the above because if you wear armour you will lose run energy. 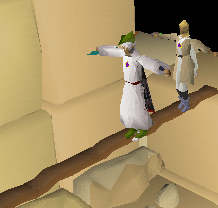 The desert robes will help you as you won't die from thirst. 200-400gp, depending on how you wish to get there (explained below). Boots of Lightness - to be equipped when you enter the pyramid. Leave at least 2 spaces open for your reward and the artifact. If you have access to the Fairy Rings transportation system, you can use Fairy Ring code "DLQ" to be teleported just north of Nardah. 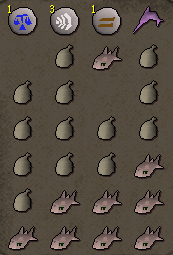 Travel south to the town for supplies if necessary, and then travel a short distance west to the Agility Pyramid. Use of the Fairy Ring system requires that you have started A Fairy Tale Part II: Cure a Queen and received permission to use the Fairy Rings. Walk from Pollnivneach to they pyramid through the desert. 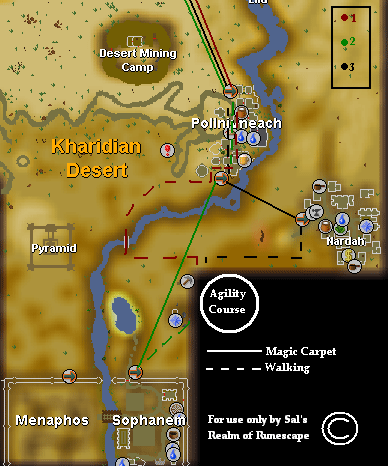 For those that have completed the desert quests - walk to the south of Pollnivneach and take another magic carpet ride to Sophanem. Walk east from there. Walk to the south of Pollnivneach and take a Magic Carpet Ride to Nardah. Walk west from here. 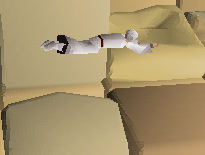 There is also a bank in Nardah if you missed anything. Once you're there, walk to the westernmost side of the arena. 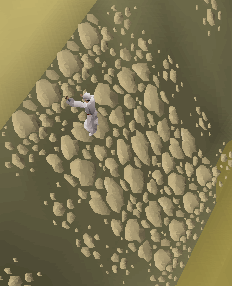 You will see a wall of rocks. 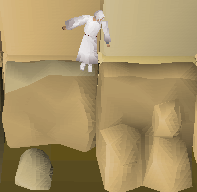 Climb down (must have 30 agility). Once inside, talk to Simon. 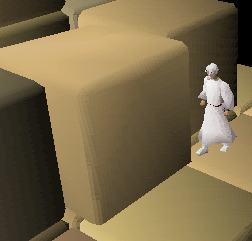 He will tell you he is working for the Varrock Museum and must recover artifacts from the pyramid. 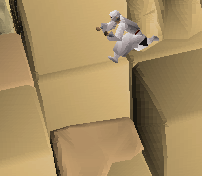 He's too weak to climb it so it looks like you're going to have to be the one to go up. 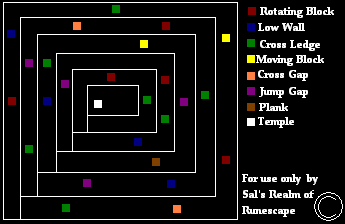 Here is a map of the obstacles on each floor. The outer section is the very bottom of the pyramid, and the sections further inside are the upper levels. A simple rotating block that you must jump over. A low wall of rock that must be climbed over. A ledge with only a small amount of walking room. Keep a firm grip or you'll fall! Run past the block or it will push you off. Keep your balance on this thin walking plank. Don't look down or you may find yourself falling. Bonus: After completing the entire course, you'll receive a 300xp bonus, for a total of 1,022 experience! Note: If you fail an obstacle, you will take damage and fall to the previous level ofthe pyramid. At the top, you will find a small temple with an artifact on the roof. As soon as you go up, you will see climbing studs on the side of it. Climb up and take the artifact. Now, make your way around to the other side of the pyramid and select the "enter doorway" option. When you have it, move over to the last to obstacles, and you can leave the pyramid, to start it over at the beginning. 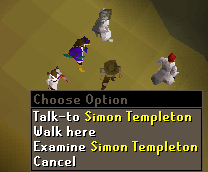 If you want, you can sell your artifacts to Simon Templeton, who can be found just outside the pyramid, for 1000gp each.